Time for another round of the seed GROW project. The first Sunday of July is just a day away and the links for July's updates about your Nasturtiums are due. What's happening with your Nasturtiums? Are they blooming? Are they vining? Have they petered out on account of your summer? Tells us! I know it is a holiday weekend, so it is ok if you're a little late. Get those links in. The Write Gardener~ First Things First. My Northern Garden~Pretty in Pots. Gardenfaerie~ Keepin' on Keepin' On. Miller Time~GROW Project: July Update. Happy Hobby Habbit~ Grow Project, Post 5. Life on The Balcony~ A Tale of Two Nasturtiums. The Garden of Live Flowers~Irrational Exuberance . 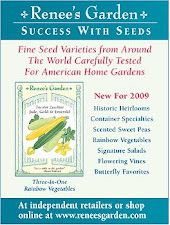 In The Garden Online~ July Seed GROW: A Flaw in My Plans. Our Little Acre~Seed GROW Project: July Update. Cheesehead Gardening~Seed GROW Project July Update. Mahlzeit~ Nasturtiums are not just for salads. The Home Garden~ Grow Project Hangin' in There. Read Between the Limes~ July Seed GROW Project. Garden Mom29~ Month of Extremes. Garden Girl~ Nasties on the Move. The Indoor Garden(er)~ Seed GROW project #4. K-Town Homestead~ Flowers in Vegetable Garden. Brown Thumb Mama~ Seed GROW Project: Baking in the Sun. Jenn's Cooking Garden~ Getting your Nasties on at night! A nighttime look at the "spitfire"
Get in the Garden~ Seed GROW Project: Spitfire-works in July. Gardening in my Rubber Boots~ Maybe Nasturtiums Like Torrential Rains. The Mini Garden Guru~ SeedGROW Project #3-Planted and Blooming. Yard is Green~ Seed GROW Project 'Spitfire' Nasturtiums. Here's my July post for Seed GROW. The nasturtiums are looking good! I'm late. My excuse? Destination wedding. I was away for the holiday weekend! Apologies. Like our summer weather in the Pacific Northwest, better late than never . . . When Hurricane Alex sent rain and cool winds our way, my nasturtiums raised from the dead and put on new growth. I'm back in, at least for this month. I have been amazingly good reading all the #seedGROW posts this month (pat pat pat, good girl! ), and it just hit me. MBT, where is *your* post? Hmmmmm? I'm late, but I've finally got my update published. Now to catch up on all of the other updates. Hi Mr. Brown Thumb. I guess I'm always late, but I keep thinking I should show the progress of The Month... anyway, here's my July post.